Not much by way of cute going on in this film – boar demons, wolf gods and human warriors tearing lumps out of each other, fatal demonic worm infections, Minnie Driver shooting the heads of forest spirits – but throughout all the anarchy these tiny little tree sprites kept their cool and did what they do best: stand there and stare. Like miniature Chinese knockoff bobblehead versions of Ghostface from Scream, it was really their forlorn gaze that made everyone go ‘aaawwwww!’ and stop fighting. 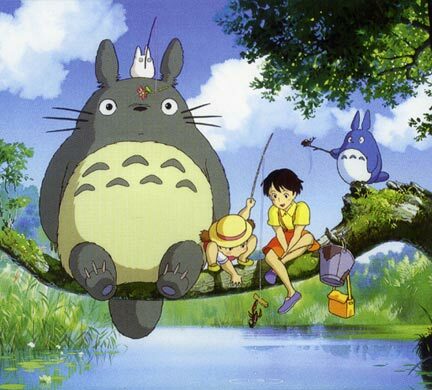 Why doesn't Totoro, the tallest friend, simply eat the other friends? A cloaked faceless masked demon who devours everything and eveyone in its path isn’t the most typical entry on a ‘most adorable’ list, but the sight of the poor thing standing out in the rain before young Chihiro leaves the door open for it just melts your heart. Plus when it went on that rampage, he had an upset tummy, so it was understandable. After some kindness and medicine from Chiriro, No-Face follws her around like a meek little lost puppy. Sweetheart! Ponyo and Sosuke, easily the cutest screen couple of all time. 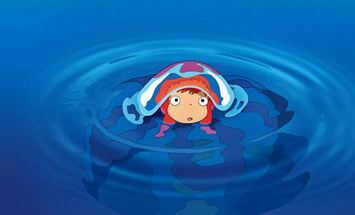 Essentially a retelling of The Little Mermaid, Ponyo the goldfish fancies five-year-old Sosuke so much that she transforms herself into a little girl. I know, it’s a bit hard to believe – five year olds fancying each other. All I remember from that age is that girls were gross, and I’m pretty sure they thought the same of us boys. The squeezable but stubborn Ponyo is so independent, she even defies cranky ocean-god dad Liam Neeson. Whenever she cries ‘SOSUKE!’ it makes my eyes more watery than her original home. It’s a cat… and it’s a bus! Alright, so this particular moggy isn’t the sweetest-looking kitten you’ve ever seen, but the concept simply couldn’t be cuter. Imagine after a long day at work, instead of trying to doze on a sweaty condensation-covered window that thumps you back awake every time the noisy chugging claptrap jolts over a bump, you snuggle up to cozy feline fur as the giant moggy silently pads its way over treetops. Only problem is when the bus spots a Volkswagon Beetle and decides to chase it…. 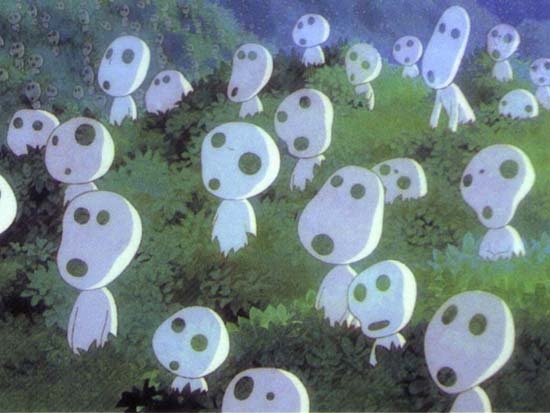 This entry was posted on August 11, 2011 at 10:40 am and is filed under TOP FIVES with tags Animation, Ghibli, Hayao Miyazaki, Movies, Ponyo, Studio Ghibli. You can follow any responses to this entry through the RSS 2.0 feed. You can leave a response, or trackback from your own site. It’s going to be an unpopular comment, (but when are my comments popular?) but I find studio Ghibli a bit freaky. 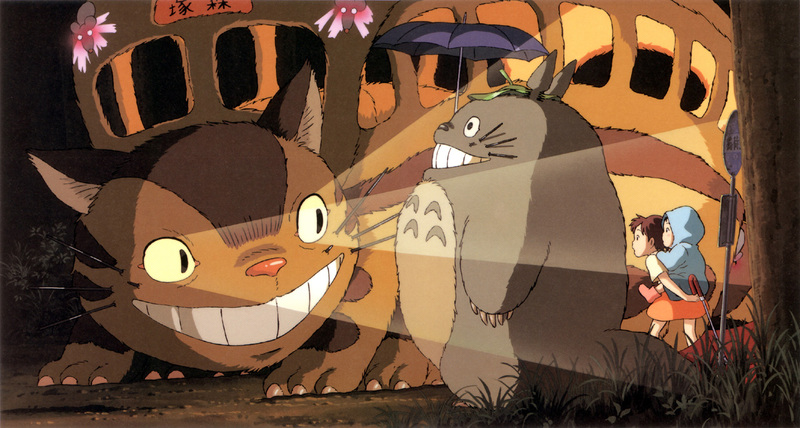 I’m with you on Totoro. That guy is cute. But I find a lot of the other characters a wee bit scary. That cat bus for one gives me the creeps. And whatever those things are at the top of the list. Thanks for that. Gonna have nightmares now…. It had to happen sooner or later Katie, but we are OVER! (Actually I can’t) I did try to like them. I think we’ve had a similar conversation before: I like totoro and howl’s moving castle but Mononoke is just a bit too weird for me. This is coming from someon who was absolutely terrified of the moomins as a child. They’re all so cute! I love em all. Not sure if I could rank them but you certainly picked some of my favorites. yeah i have to say McD, I worry about what teddy bears you cuddle up to at night. who wouldnt want to take a spin in a Cat Bus though? You have an odd definition of “adorable” ahah 😉 That No-Face was creepy to me! 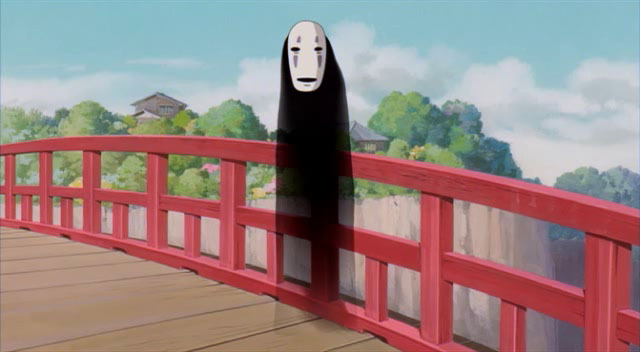 No Face is most definitely not cute. He has no face for God’s sake!! The cat bus has an evil grin. It’s like he wants to eat you. lol. who would have thought it would all come to an end over a scafry faceless cartoon? This is a genre of films I really need to see more of. Neat list and great to see the Kodamas make an appearance…even though, for me, Mononoke is waaay down on my list of favorite Ghibili films. this guy’s movie is ALWAYS wonderful!